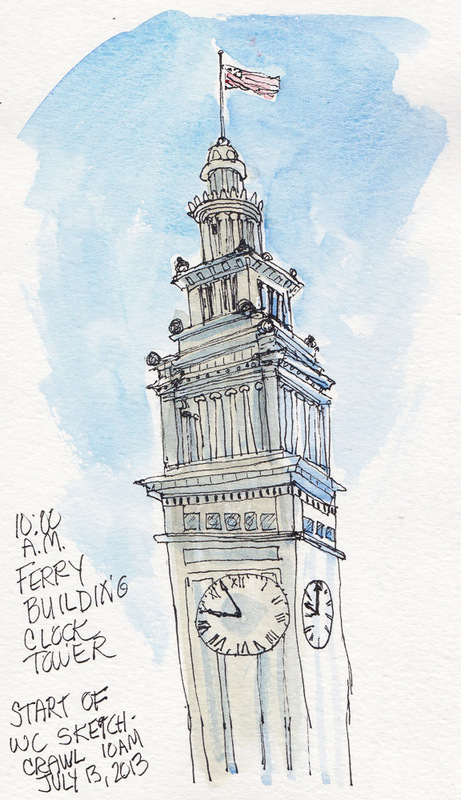 While I waited for the Sketchcrawl to begin I started drawing the Ferry Building clock tower. The clocks weren’t really set for different times. It looks that way because I drew what I saw: by the time I got to the right clock it was 7 minutes later. 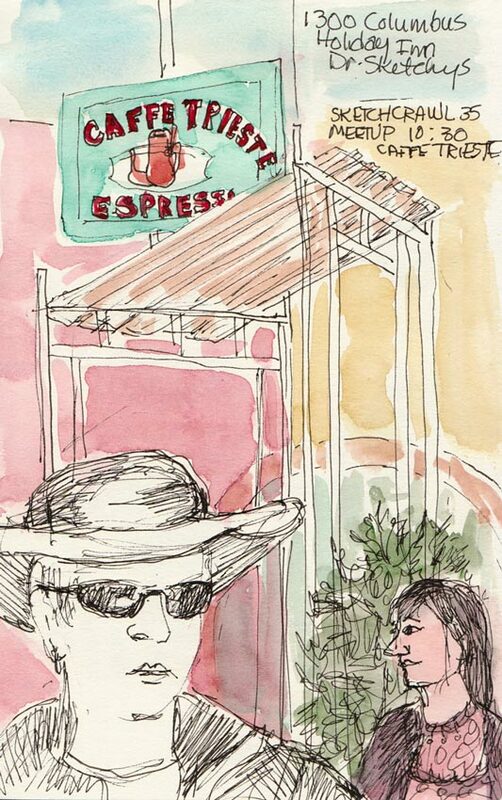 Next I tried to draw the sketchers on the little plaza across from the Ferry Building (above). My perspective got way wonky on the street on the right. Although there are many hills in San Francisco, this street is actually quite flat. Behind the Ferry Building I watched the huge Marin ferry arrive. 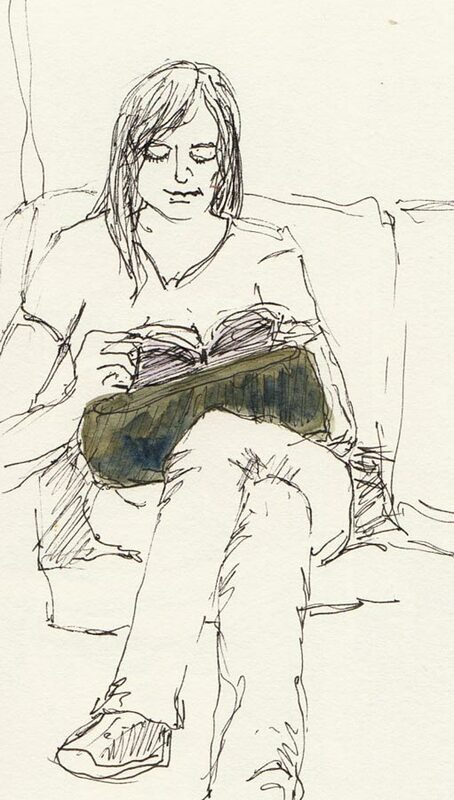 I knew I only had about ten minutes to draw it while passengers got off and on. I nearly finished the drawing before it headed back out so added the colors I remembered afterward. I’m glad I didn’t wait until the last minute to use the restroom in the Ferry Building. There were 35 women in line for the ladies’ room and only about 3 for the men’s. Why? It was interesting drawing the women right in front of me because of the odd foreshortening I perceived looking down their backsides. 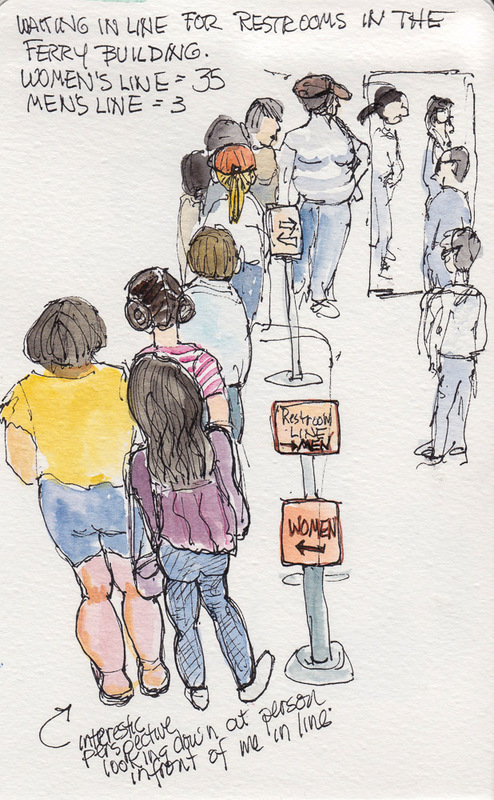 Next time you’re waiting in line, try to draw the person right in front of you and you’ll see what I mean. Later someone gave me a valuable tip I’ll share with you: there’s a little used ladies room on the second floor of the building. I wonder why the Ferry Building management doesn’t include that information in the signage directing people where to stand in line for the downstairs restrooms. 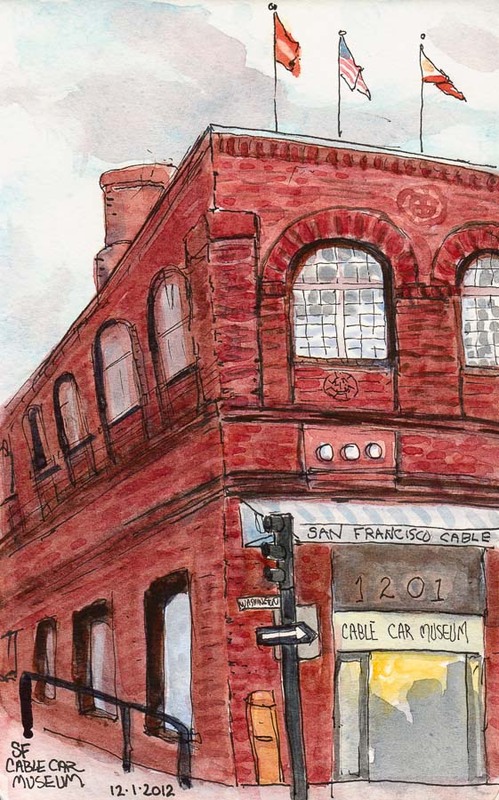 The San Francisco Sketchcrawl was so much fun and had a great turnout of around 75 people. It was great seeing old friends and meeting new ones. 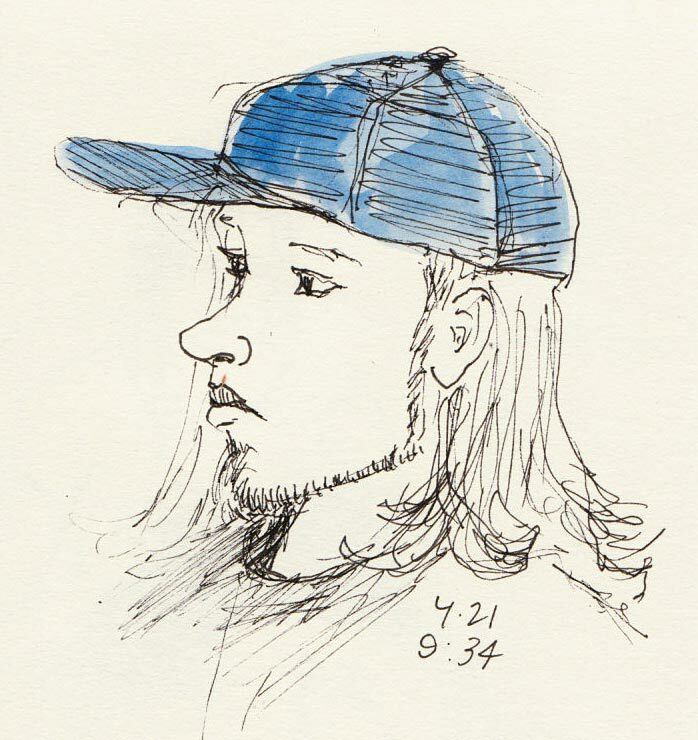 This was actually my last sketch of the day, finished just before our 4:00 meetup. 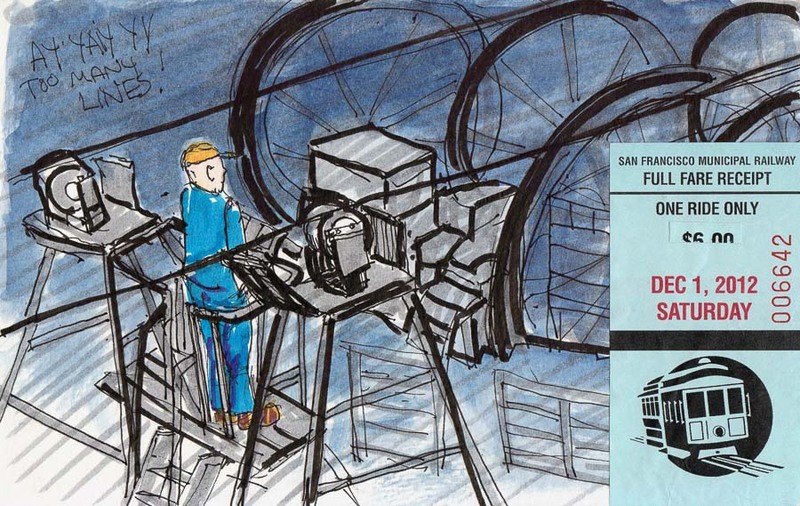 Micaela and I were going to walk the hundreds of stairs up to Coit Tower to draw it but got distracted by all the other events going on along the Embarcadero on our way. 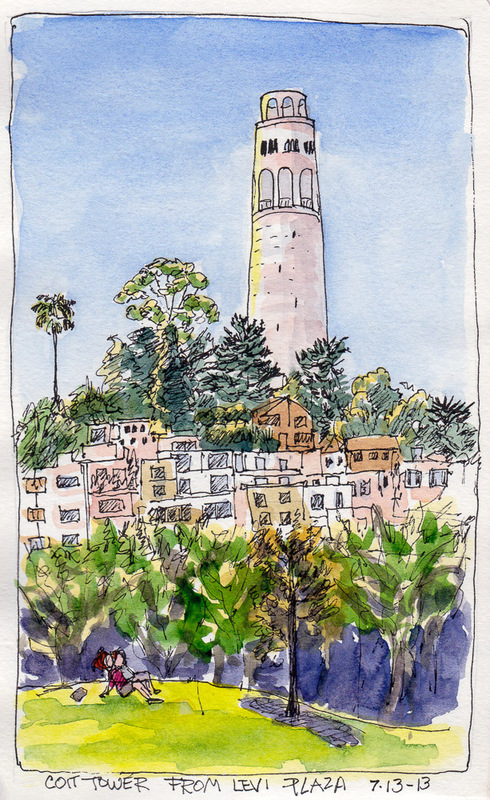 We realized there a was a great view of the tower from inside Levi Plaza, a beautiful, somewhat hidden park that I’d like to return to for more sketching. There’s a non-residential street a couple blocks from my house where this bus and its two colorful sisters are often parked. 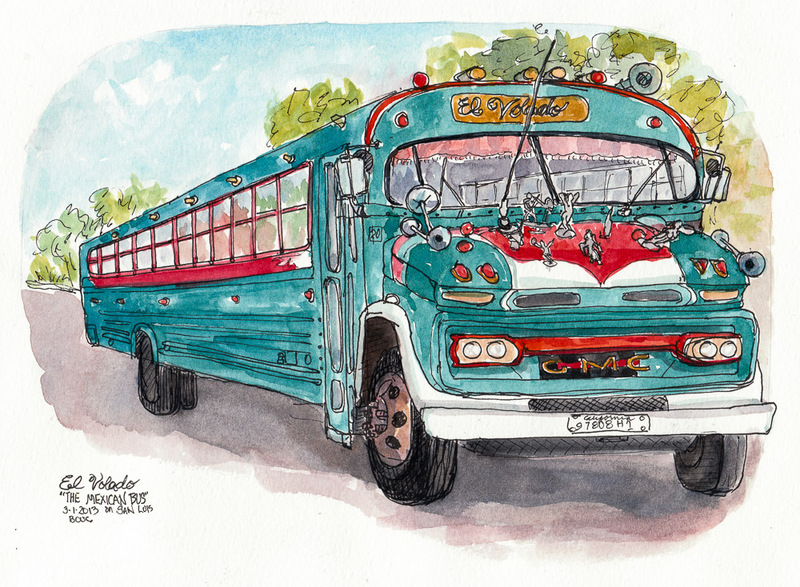 I sat on the corner and sketched my favorite, named “El Volado, The Mexican Bus” (as is written on the bus) on the first page of my giant Moleskine. 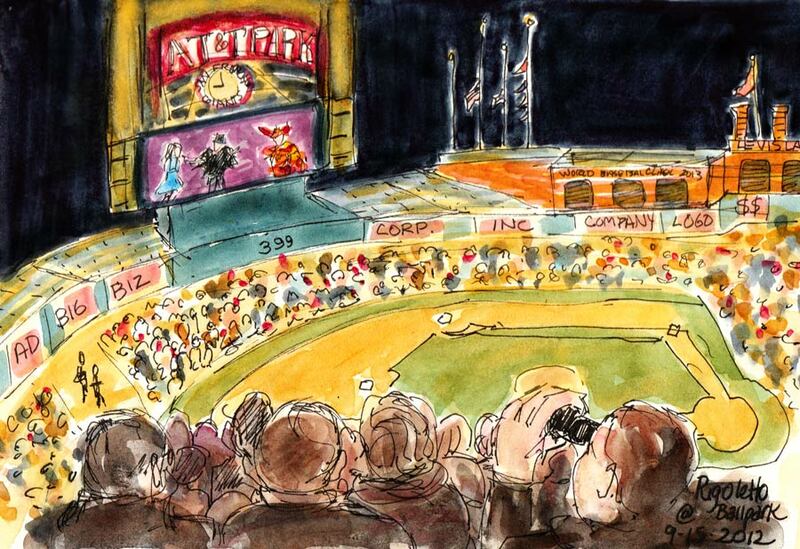 I did a little preliminary work in pencil to get the basic dimensions and then continued in ink and watercolor. After spending yesterday traveling around on public transit, a bus seemed a good subject to post today. 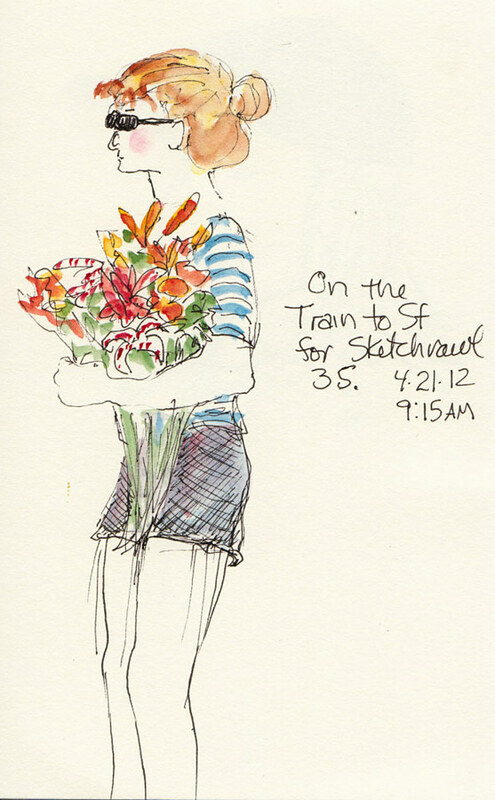 I took the subway and then a streetcar to visit a friend and her toddler in San Francisco. We walked from her house to the California Academy of Science in Golden Gate Park. It was fun seeing penguins and beautiful fish in the huge coral reef aquarium through the eyes of a delighted 20 month old. At nap time I walked them home and then back to the park. I ate lunch in the more peaceful atmosphere of the De Young Museum cafe across the plaza from the Academy which had been crammed with hundreds of noisy school kids on field trips. After lunch I visited the “blockbuster” Girl With a Pearl Earring: Dutch Painting from the Mauritshuis and Rembrandt’s Century shows. The museum was fairly empty, with easy access to close-up views of all the amazing work. After a brief, failed attempt at sketching in the plaza (just too tired) I walked back to the streetcar, stopping for a coffee for fortification along the way. 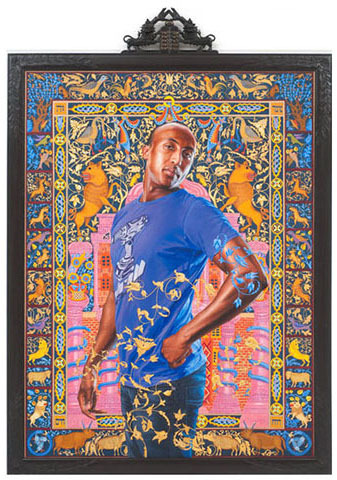 My next stop was the Jewish Contemporary Museum downtown to see a show of portraits by Kehinde Wiley, who is known for his grand portraits of black urban men from around the world. This show, The World Stage: Israel features Israeli Jews, Ethiopian Jews, and Israeli Arabs and elaborate religious Jewish designs. I had looked forward to seeing this show but was disappointed by how much the oil paintings looked like slick digital art, with no sign of the artist’s hand. That was validated when I found this article that says, “…his actual paintings are created by teams of assistants in China…But great portraits are not about formulae; they are about expressing something about an individual.” And hopefully there is something in them of the artist too, like the Rembrandt and Vermeer portraits I saw earlier in the day! 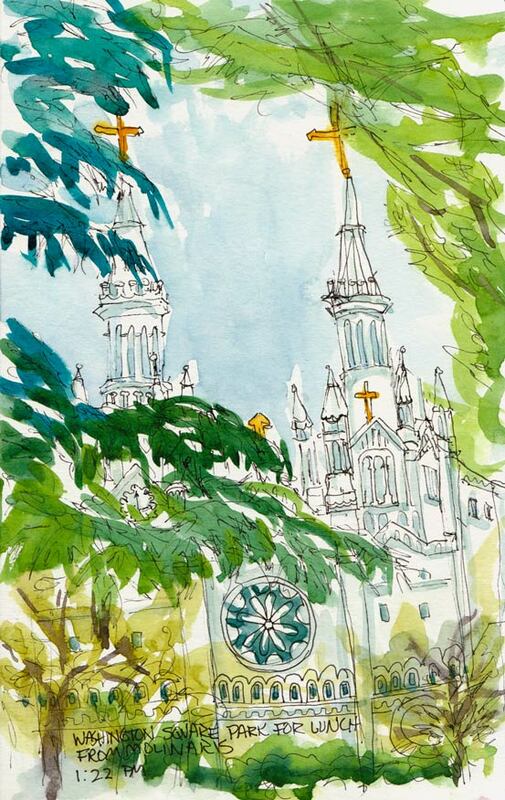 We brought our lunches from Molinari’s Deli to Washington Square Park where we sat in the shade of a tree to eat and then sketch Saint Peter and Paul’s Church. I started in a smaller sketchbook first (below) and then decided to start over (above) in the larger watercolor Moleskine I’ve been using lately. 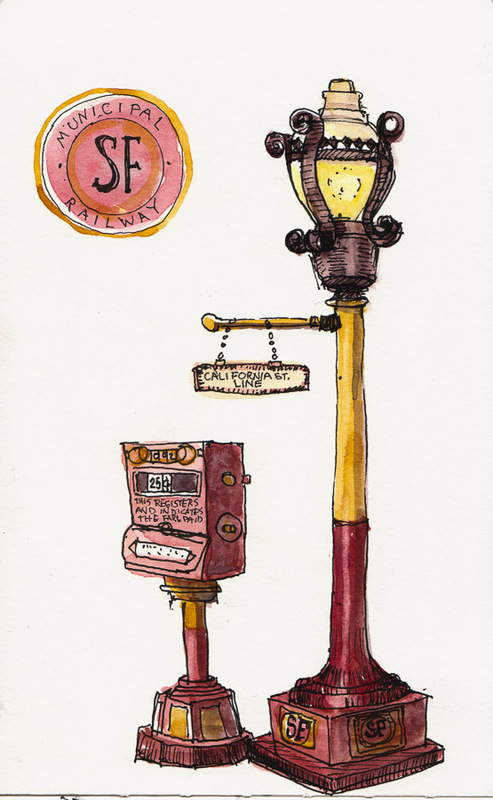 Then we made the long walk to the Fisherman’s Wharf Holiday Inn for the Tease-O-Rama sketching. 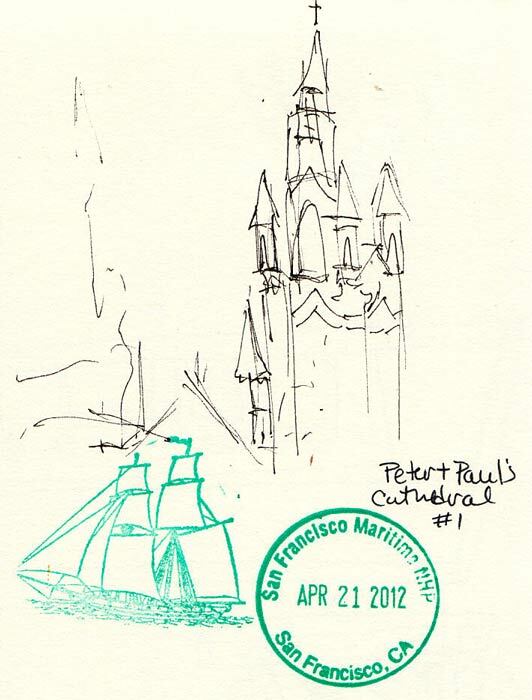 From there we walked down to Maritime Museum where I stamped the page (above) with their National Park rubber stamps when we arrived at Aquatic Park. 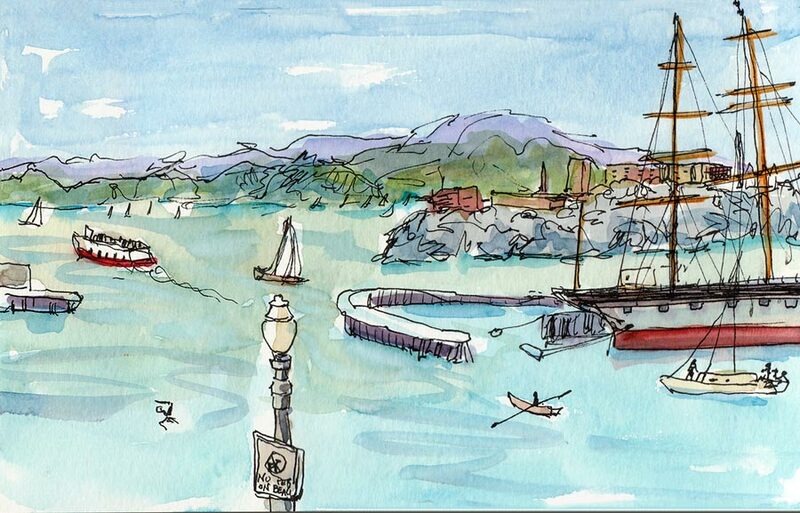 Above is the last sketch of the day, my view sitting on the stairs at Aquatic Park, across the street from Ghirardelli Square, the Sketchcrawl meet-up spot. Above is a bigger picture of the left side of the spread, looking out towards the Golden Gate Bridge on the left, Marin County in the middle, and people playing at Aquatic Park. Behind the big ship Balclutha on the right (part of the San Francisco Maritime National Park), is Alcatraz. On the left is the ferry, taking people from San Francisco to Larkspur in Marin County. 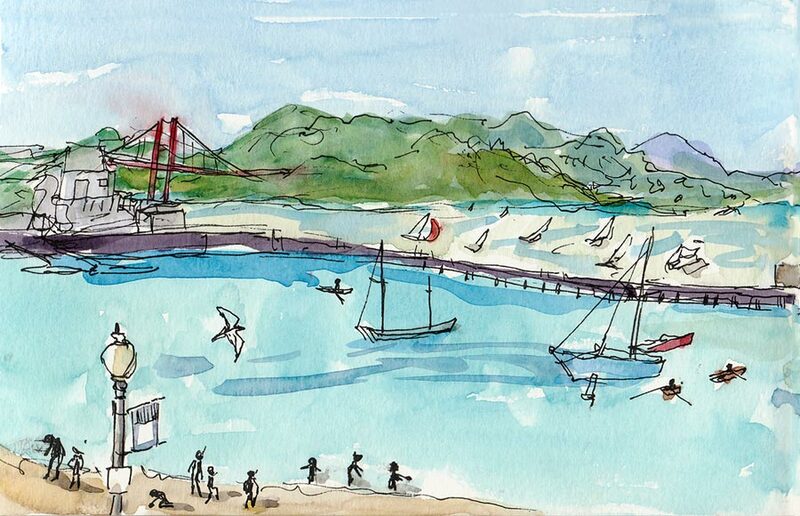 The bay was full of sailboats, kayaks and even people swimming on this unusually warm and sunny spring day. I feel so blessed to live in such a gorgeous area with an incredible variety of people, places, and scenery! 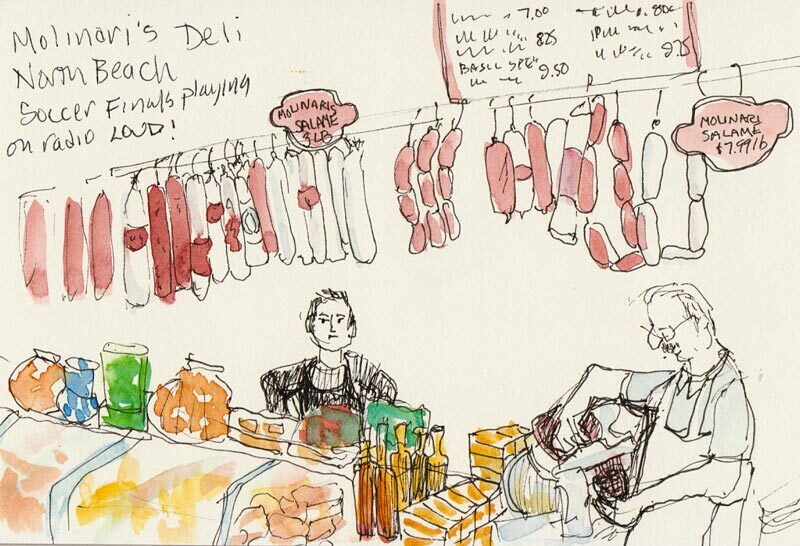 I’m also very grateful to both Enrico Casarosa who started the International Sketchcrawls and Gabi Campanero who created Urban Sketchers, and the opportunities their organizations offer for us to enjoy the art of sketching together.